Looking for the best boots for welders? Here are our top picks which we chose carefully after a lot of testing and deliberations. How to pick good welding boots? Overall, these boots will ensure the comfort, cushioning and safety of your feet at all times. This is crucial for welders, who spend their days standing on their feet, and who can easily be injured by falling heavy objects or by the sparks from the welding. 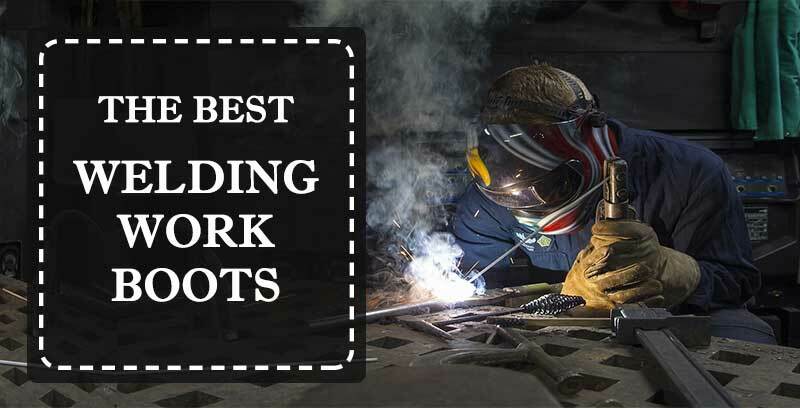 These are our top pick in the best steel toe boots for welding category as well! In conclusion, these work boots are great for welders, because they provide a comfortable fit, suitable for people who spend countless hours standing up. They are durable and made of high quality materials, so they are definitely worth considering when shopping for new work boots for welders. In conclusion, we must say that these boots are amazing work boots, which will keep your feet protected, will provide you with the ultimate comfort, and will last for quite a bit of time, due to the high quality materials and construction of the shoes. They are definitely suitable for welders. There is one thing we don’t like is that the insoles are too thin and uncomfortable. The good news is that is it easily fixed with a pair of quality insoles. Given the above-mentioned characteristics, these boots are absolutely perfect for welders. They will keep the feet protected, dry, comfortable and safely standing on the ground at all times. Given all these marvelous features, these Danner work boots are an excellent choice for welders. They will keep the toes safe, the feet dry, warm and comfortable. The shock absorption feature will help reduce fatigue and foot and leg pain, and the perfect traction of the outsoles will keep you standing steadily up both on dry and wet surfaces. If you don’t want to lace and unlace your work boots every time, these classic roper boots from Justin are a great choice. They are comfortable, durable, sturdy and will keep your feet dry and comfortable during the long working hours. If you are a welder, you need to make sure that you find the most suitable work boots, which will keep your feet protected from falling heavy objects, against the sparks from the welding process. You should also look for boots which have excellent traction and possibly electrical hazard certified. Of course, your boots should be comfortable, provide great shock absorption. Also, make sure you choose breathable and waterproof boots, especially if you work in wet conditions. Make sure you pick boots which are of high quality materials and a strong construction, so that you will be able to wear them longer.